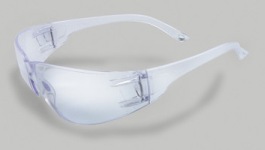 Radnor Classic Safety Glasses are designed with a single, scratch resistant, polycarbonate, wraparound lens that blocks 99.9 percent of UV rays. For increased wearer compliance these glasses accommodate a variety of cords with a flexible temple design. These glasses meet ANSI Z87+ Standard.